Plenty of snow for SNOWBOARDING and SKIING in YOSEMITE NATIONAL PARK! Manzanita Hill is a beautifully furnished upscale vacation home, fully renovated in 2016. It has all-new flooring, paint, doors, cabinets, sinks, counter tops, windows, appliances and more. Located in the Sierra foothills, between Mariposa and Oakhurst, this home has convenient access to both the west and south entrances of Yosemite Park. There are great things to see and do inside both park entrances. Bass Lake is also nearby, with its sandy beaches, good swimming and boat rentals. We provide lots of detailed info at the home to help you enjoy your stay to the fullest. You're welcome to walk this 7-acre property along our private groomed hiking path, to enjoy the beautiful scenery both near and far! This open-floor-plan 3 bedroom / 2 bath home is augmented by ample outdoor living space. There is a large partially covered front deck with dining table and an even larger back deck with BBQ and two dining tables and comfy outdoor seating where you can be immersed in quietude and beauty. You'll enjoy the attractive custom carpentry and stone work that has been done to make the back deck blend seamlessly into the surrounding granite boulders, trees and natural landscaping. At night you'll love the ambience of a majestic Manzanita tree which is illuminated! This home sleeps 8 comfortably, with two queen size beds, two twin beds and a queen size sleeper sofa. Hi-speed WIFI is provided, so bring your devices! The Verizon cell phone signal is strong and a land-line phone is also provided for local calls. This home has a tasteful and warm historic-western-lodge decor that harmonizes beautifully. The living room includes accents of antique heirloom furniture in the midst of comfortable new upscale furnishings. There is even a real western saddle on display in the corner along with an elusive Jackalope mounted on the wall. A large flat screen TV is built into the rustic stone fireplace. The open and spacious fully equipped kitchen has quartz counter tops, ample rustic hickory cabinets, new appliances, and everything you'll need for preparing and serving your meals. Comfort is assured with forced-air central heating and air conditioning throughout. You'll never run out of hot water with our instant on-demand water heater. If you're looking for a wonderfully located, beautifully decorated, upscale home for your Yosemite adventures, you'll just love Manzanita Hill! Our guests especially enjoy stargazing at night as well as catching glimpses of local deer, cottontail and jack-rabbits as well as the beautiful gray tree squirrels! Local and responsive property managers. Kept very clean, with attention to detail. Clear delicious mountain well water, safe to drink right from the tap. No need to bring bottled water. All linens, bedding and towels provided. Paper towels, napkins, Kleenex, toilet paper, trash bags, eco friendly sponges, shower gel, hand soap, dishwasher and dish washing soap are all provided. Salt & pepper, spices, sugar, olive oil and red wine vinegar are provided. Kitchen is fully equipped: Dishwasher, large side by side refrigerator, electric induction range/oven, microwave, 12 cup coffee maker (with eco friendly gold filter) has hot water on-demand for tea, electric hot water kettle, French press thermal coffee carafe, burr coffee grinder, large toaster, crock pot, food processor, blender, mixer, turkey pan, full array of cooking utensils, knives, pots and pans and accessories, ample matching Mikasa stoneware dinnerware, glasses, ice bucket, vases, utensils, etc. Stainless steel gas BBQ grill and accessories on the deck with searing burner. Ice chests, large Thermos and Blue Ice provided for use by guests for excursions. Ample comfortable deck furniture and outdoor dining areas. Horse-shoe pit for friendly competition. New front-loading washer and dryer with laundry soap provided. All bedrooms have dressers, luggage racks, closets, clothes hangers, extra pillows, and blankets. USB charging station and high speed WIFI provided. Good Verizon cell phone reception plus landline phone. Dish network satellite TV including local network affiliates plus DVD player and DVD library, board games, puzzles and cards. Several interesting books about Yosemite and the area plus novels. Pack n' Play crib and adjustable high chair. Wall art and interesting photos throughout the home. Very effective forced air heating & air conditioning, ceiling fans in every room. Plenty of windows to enjoy the outdoor views. Solid wood bedroom doors and moldings. Laminate flooring throughout the home. Ironing board with iron and a pull out drying rack for hand washables in bath/laundry room. Fresh roasted coffee available less than 2/10ths of a mile away. 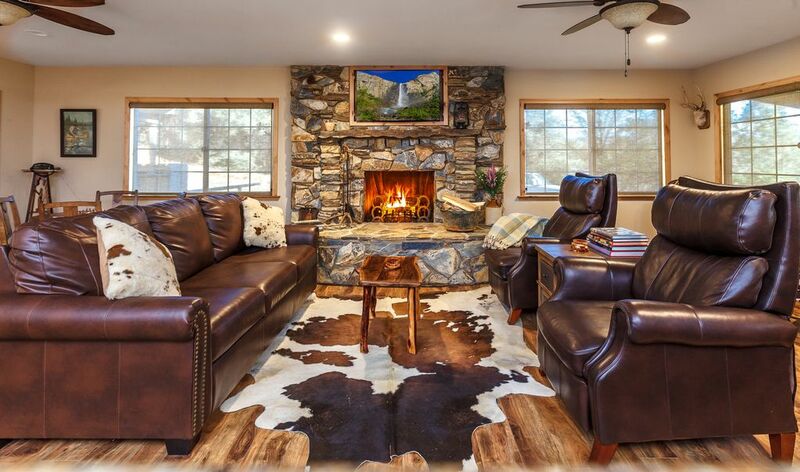 Manzanita Hill is locally managed, on the owners' behalf, by Bruce and Magdalena Beall of Yosemite Vacation Rental Management. We're on call to respond to your needs and questions before, during and after your stay. We'll also supply you with information and answer your questions about things to see and do during your vacation to make it the best it can be, customized to your own needs and tastes. We think this home is in the perfect spot! It's a great location, midway between Mariposa and Oakhurst. Both Mariposa and Oakhurst are great towns, but with differing amenities and feel. Mariposa, 10 miles away, is picturesque, quaint and smaller, with interesting museums and several good dining choices. It's the closest town to the west entrance of Yosemite Park and the famous Yosemite Valley. (The west entrance of Yosemite, along Highway 140, is 38 miles from this rental home.) Oakhurst, 16 miles away, is the closest town to the south entrance of Yosemite (The south entrance of Yosemite, along Hwy 41, is 32 miles from this rental home). Just inside the south entrance is the Mariposa Grove of giant sequoias and the Wawona area with its grand historic Wawona Hotel/restaurant. There are inviting natural river-swimming areas, pleasant hikes and the expansive Pioneer Yosemite History Center with historic buildings, carts and carriages on display, horseback and carriage rides, and a working blacksmith shop. Delicious all-you-can-eat BBQ picnics are served weekly on the lawn of the Wawona Hotel on Saturday evenings all summer. Oakhurst has additional amenities like a multiplex movie theater and a multitude of shopping venues, including a Raley's and Von's grocery stores and several dining choices including pizza, Mexican food and a wonderful brewery/restaurant. It is also near the Sugar Pine Railroad (a historic full-size steam locomotive providing narrated family-oriented excursions through the mountain slopes plus a picnic and gold panning lessons). On the way home from the south entrance, visit picturesque Bass Lake (23 miles from this rental home), with its many sandy beaches, hiking opportunities, boat rentals and restaurants. Bass Lake water is a comfortable temperature for swimming in the summer. This home has been fully renovated, inside and out, over a 2 yr. period with great attention to detail and quality. The quiet large back deck is perfect for stargazing and relaxing with family for togetherness in a natural setting. It has a gas BBQ grill, outdoor dining tables and comfortable seating. This deck is built to blend seamlessly into the surroundings, wrapping tightly around the natural granite boulders, oak and manzanita trees. It has an attractive rock retaining wall and a privacy fence on one side keeping it intimate and separated from the driveway area. You'll love the ambience at night when a majestic Manzanita tree up the hill is illuminated for your enjoyment! Enjoy strolls on your own private hiking path amidst the beauty of this 7 acre property, or play horseshoes in the side yard. toilet, shower, Large sink, cabinets, washer/dryer, coat rack and more. Both bathrooms have Quartz counter tops, nice lighting, windows, new plumbing fixtures and vinyl flooring. Small clothes drying rack in 2nd bathroom. Located in the beautiful Sierra Nevada foothills between Mariposa and Oakhurst, California. 7 acres of beautiful nature with a groomed hiking road on the property for your exclusive use. Land-line phone provided for local and emergency calls. Cell phone signal is strongest for Verizon users. Forced-air heating from central furnace. Throw blankets provided for curling up by the fire. All linens are provided along with extra pillows. Large new front loading washer (in second bathroom) and laundry detergent is provided. Large new front loading stacked dryer (in second bathroom). Beautiful stone wood-burning fireplace available for use during late fall, winter and early spring. Candelabra for ambience during the balance of the year. Plenty of towels, hand towels and washcloths provided. Wi-Fi and a nice portable Bluetooth speaker for use with your phone. Open concept great room includes a comfortable living room area, sleeper sofa, recliners, throw blankets, a writing desk, a game table and dining area with adjoining breakfast bar. Laminate floors. 18" Bosc, new. Detergent provided. New. French doors with freezer & ice maker below. Blue Ice for excursions. New electric range with induction cooktop. 12 cup automatic coffee maker with reuseable gold filter. A French Press, (fresh roasted coffee available for purchase just 1/4 mile down the road). Burr grinder. Electric water kettle. Sugar, S & P, spices, oil and vinegar provided. Condiments usually on hand. Napkins, paper towels, sandwich bags, foil & plastic wrap. Ice chests, Thermos & Blue Ice for excursions. Ample stoneware dinnerware, glassware, cooking and eating utensils, serving pieces, pots, pans and extras, with attention to detail. Wine bottle chiller. Set up nicely for cooking holiday meals. Fully equipped, incl: coffee maker, kettle, cork screw, wine chiller, ice bucket, crock pot, blender, food processor, mixer, roasting pan, utensils and knives, cutting boards. Vinyl floor. Dish soap. Large flat screen TV located over fireplace. DVD player and DVD library. Flat screen TV with Dish Network satellite TV, including local network affiliate stations and PBS. Includes Sirius music stations. Built into rock fireplace. Sirius music channels available on the TV. Assortment of books about Yosemite National Park and the Sierra Nevada, local history and points of interest, western movies and several novels. Board games, card games and puzzles provided. Designated game table in the great room. Horse shoe pit in the side yard. Irrigated landscaping keeps the entry area beautiful. Native trees, shrubs and natural rock formations provide natural landscaping. Kayaks and canoes can be rented and used at Bass Lake, 18 miles from this home. It is a large beautiful mountain lake. Boats of many kinds and sizes can be rented and used at Bass Lake, 18 miles from this home. It is a large beautiful mountain lake. Two decks, each with an outdoor dining area. The front entry deck is partially covered. The back deck is lovely, quiet and comfortable with wicker seating, immersed in natural surroundings. Snow skiing (both downhill and cross-country) is available, in season, at Badger Pass Ski area (now called Yosemite Ski & Snowboard area) inside Yosemite Park. Public tennis courts are available at the Mariposa County Park in Mariposa. Two golf courses in nearby Ahwahnee. Enjoy the flora and fauna in this lovely Sierra Foothill country setting. Being above the valley fog, we have a lot of sun at this elevation of around 3000 feet. There is abundant wildlife here with deer sightings being a common occurrence. Beautiful, spacious, clean. 5 Stars! After a long flight and three hour drive we were welcomed first by deer in the yard, then a beautiful fireplace ready to light. A spacious kitchen that meet all our needs and everywhere you looked there were those little “touches” that make a house a warm and inviting home. Because we spent our days in the park we didn’t get a chance to take advantage of the beautiful deck. After a long day exploring, the well appointed kitchen area with plenty of seating, became the perfect gathering spot to share pictures and stories. Privet and quiet setting. Overall we didn’t have any issues and were very happy. Any questions I had were answered immediately with a phone call. We had such a WONDERFUL time here in your gorgeous home, surrounded by this beautiful area!! I appreciate the decor and amenities, as well as how clean and tidy everything is. Such a nice drive into the park, as well as Mariposa and Oakhurst. Our kids said that this is their "favorite cabin ever!" We will definitely come again! Beautiful and very clean home. Our family had an awesome stay at Manzanita Hill. The house was very clean and that was so important to me. Plenty of room for our family of 6. The kitchen was fantastic with everything you needed to cook and entertain. It was fun to walk around the property and enjoy nature. Deer would come into the yard daily and we also saw some coyotes. We enjoyed the wood burning fireplace and the plethora of wood stacked out on the porch. This house sits in the middle of the south and west entrances to Yosemite. We did both drives and they were beautiful. The little town of Mariposa was cute. We would definitely stay again. Thank you for sharing your home with us. Beautiful clean updated 3 bed/2bath with everything you need and more. Thank you for all the little details added. Great information let in personal notes. Extremely clean and beautifully decorated in mountain decor. Every kitchen gadget you can ask for. Loved staying here, would do it again and highly recommend. This is one of the loveliest places we’ve ever stayed at! Charming accommodations in a beautiful private setting! There were even deer frolicking in the yard! Kitchen was stocked with every possible gadget we could need. Beds were extremely comfortable. It was a bit further from Yosemite than we expected (about an hour) but the drive was lovely so we got used to it. Would highly recommend this place to anyone! Stunning , immaculate, comfortable home! I wish I could give more than 5 stars because this house was so wonderful! Beautiful inside and out. We loved the outdoor space and enjoyed evenings out there after a long, tiring day at the park. Plenty of room for our family of 7. Awesome, gourmet kitchen with everything you'd ever need to cook meals. Comfortable beds and gorgeous bathroom attached to the master bedroom. The drive to the park averaged an hour and 20 minutes, but we didn't mind the drive as it was scenic and we saved money by staying outside the park. We really loved the town of Mariposa with it's great restaurants and shops. I highly recommend this property and wouldn't hesitate from staying there on our next trip to Yosemite! We think this home is in the perfect spot! It's a great location, midway between Mariposa and Oakhurst. Both Mariposa and Oakhurst are great towns, but with differing amenities and feel. Mariposa, 10 miles away, is picturesque, quaint and smaller, with interesting museums and several good dining choices. It's the closest town to the west entrance of Yosemite Park and the famous Yosemite Valley. (The west entrance of Yosemite, along Highway 140, is 38 miles from this rental home.) Oakhurst, 16 miles away, is the closest town to the south entrance of Yosemite (The south entrance of Yosemite, along Hwy 41, is 32 miles from this rental home). Just inside the south entrance is the Mariposa Grove of giant sequoias and the Wawona area with its grand historic Wawona Hotel/restaurant. There are inviting natural river-swimming areas, pleasant hikes and the expansive Pioneer Yosemite History Center with historic buildings, carts and carriages on display, horseback and carriage rides, and a working blacksmith shop. Delicious all-you-can-eat BBQ picnics are served weekly on the lawn of the Wawona Hotel on Saturday evenings all summer. Oakhurst has additional amenities like a multiplex movie theater and a multitude of shopping venues, grocery stores and dining choices. It is also near the Sugar Pine Railroad (a historic full-size steam locomotive providing narrated family-oriented excursions through the mountain slopes plus a picnic and gold panning lessons). On the way home from the south entrance, visit picturesque Bass Lake (23 miles from this rental home), with its many sandy beaches, hiking opportunities, boat rentals and restaurants. Bass Lake water is a comfortable temperature for swimming in the summer. Please note: the maximum occupancy of this vacation home is 8 and this includes babies. Extra payment over 6 also includes babies. Payments must be made by credit card via the HomeAway payment system. Bookings for dates before April 1, 2019 will receive a 2% refund on their tax because the Mariposa County tax rate will increase to 13% as of that date.